Hi pretty! If you’ve been following this blog, you know that I’m a planning addict. Planning is an amazing habit to master! 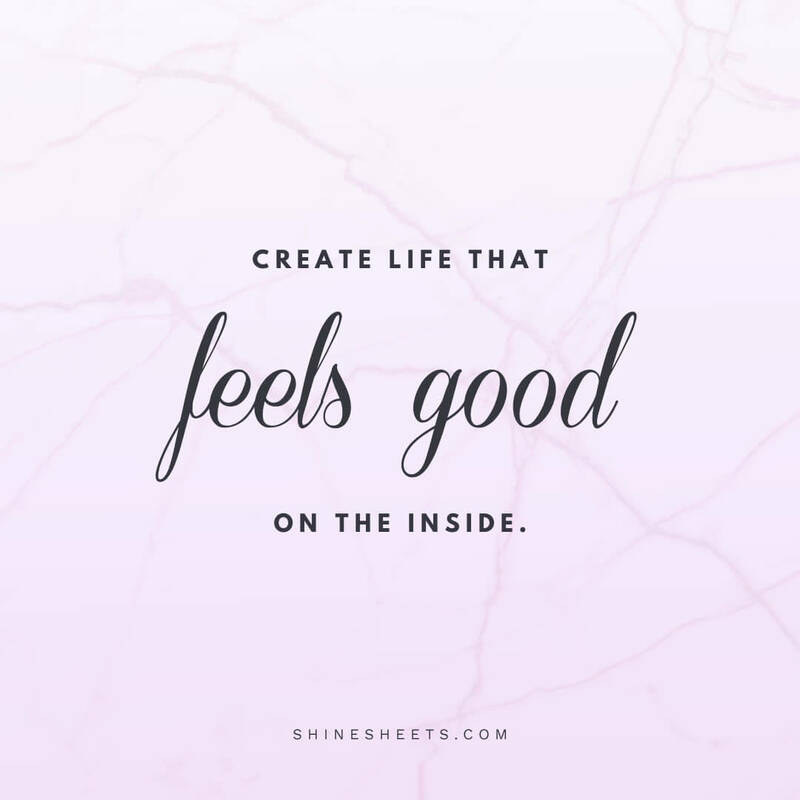 It helped me get my life back and supported me while I took small, anxious steps in my early twenties. That time was hard for me and I knew I had to do something. Read about it here: How to beat negative thoughts and restart yourself. 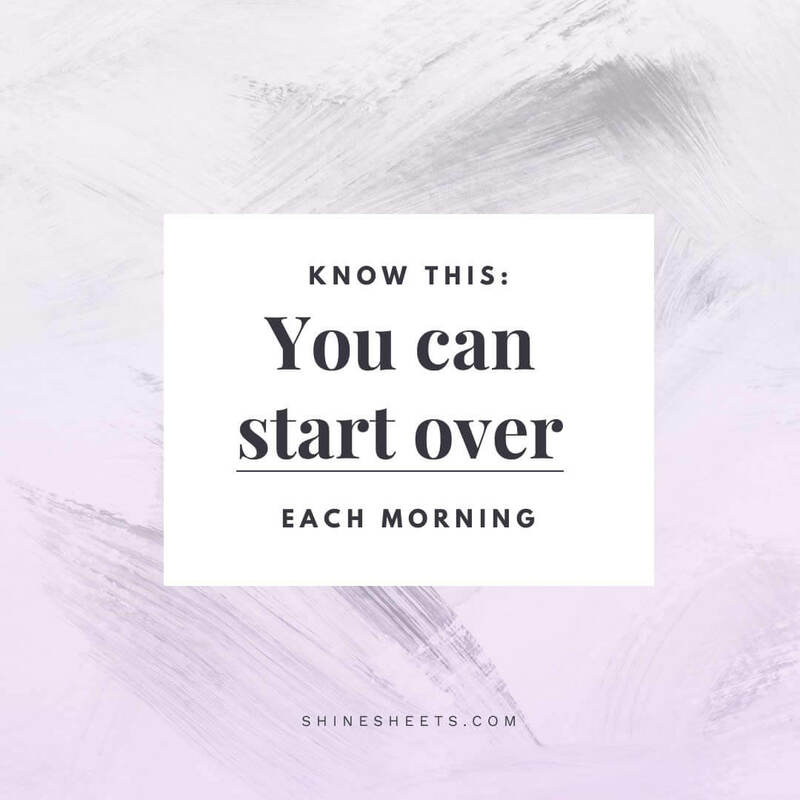 I’ll be straight with you – if you want to stop being lazy, get your life together or finish hoarded tasks, start planning today. It is a simple, reliable way to change anything you don’t like. Why? Because planning is like writing instructions to yourself. Ever tried assembling IKEA furniture without instructions? It’s possible, but it’s straight-up torture! It takes much longer, you have to redo things… and at the end, you still have extra bolts left (“Wait…these should be IN the furniture!”). But that’s exactly what you’re doing every time you try to achieve things without a plan. Missing things, forgetting things, ignoring things, cursing things and basically living a hot mess of a life. It’s so much easier to work by directions instead of doing things randomly! bring back the peace of your mind. regain the feeling of control. finish big and boring tasks. stay motivated and keep going. It is also very helpful if you struggle with anxiety because it eliminates the fear of forgetting things. All you need to start is a planner that fits your needs. I will help you create one today! How to set up a planner that fits you and your lifestyle. Which sections to include in your planner. How to quickly start a planner you’ll love. How to accessorize your new planner. So grab a glass or a bottle (I don’t judge) of Rosé and become a #plannerbabe with me! 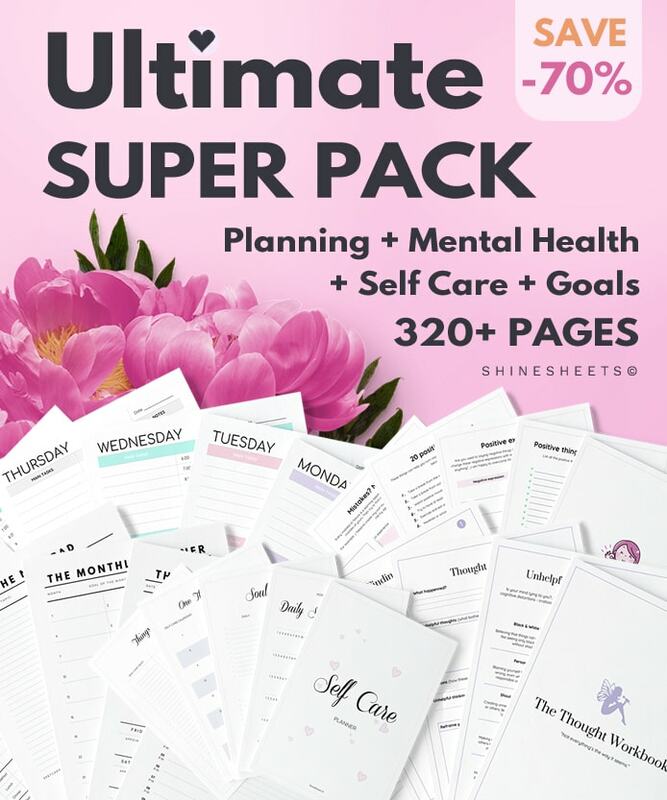 Quick notice: If you want to start planning right now, get my Ultimate, 320+ Page Printable Bundle with 70% OFF! 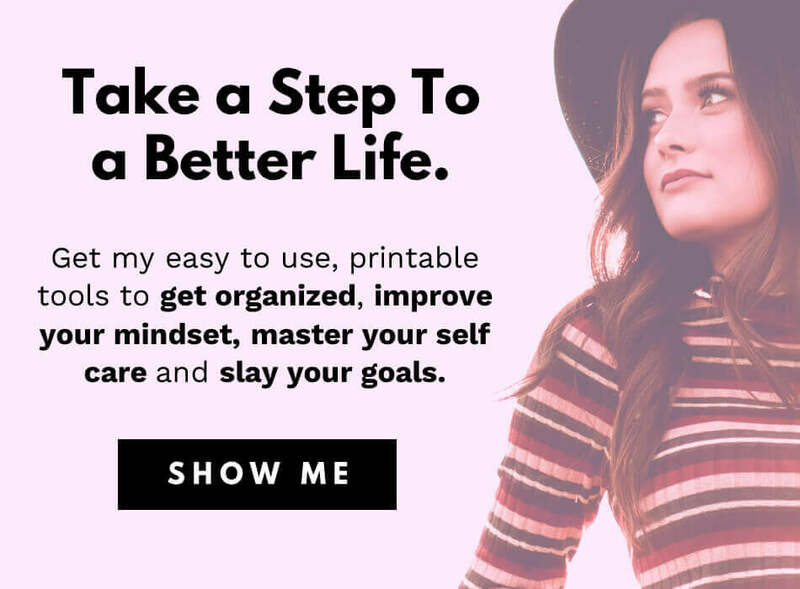 I designed modern & minimalistic printable templates that you can use to set up your planner IN MINUTES. You only need to download, print & that’s it – you’re ready to start planning. Perks: The fastest way to write a plan. You only need to buy a notebook and start writing. Downsides: May lack variety. Becomes complicated if you need to plan & track a lot of things. Perks: Fast, relatively cheap and practical. You can find a binder you like and fill it with premade templates that look good and can be printed many times. Downsides: A binder might get a little heavy if you use a lot of pages or print on extra thick paper. Perks: Bullet journaling is great if you are creative and love to draw. In a bullet journal, you are designing & painting templates yourself. Downsides: If you don’t like to draw or prefer a cleaner look, then bullet journaling will not fit you at all. Perks: These are pretty and come with a sturdy cover (usually with pockets too). Downsides: Expensive and requires looking for new inserts once you use up the ones inside. I recommend having these sections for a nice & uncomplicated planning system. Everything from the “Main Sections” is a core of every planner. 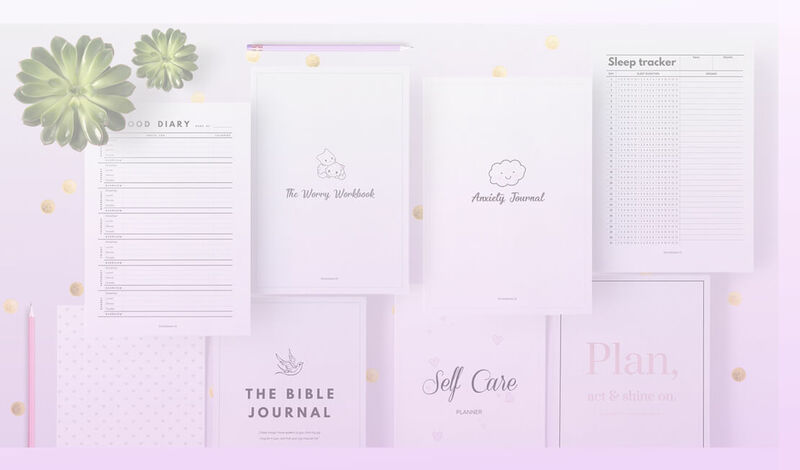 If you want to try a printable planner, click on any listed section to see a fitting product at the ShineSheets store! These planners control your time, calendar, tasks, health & finances. These are the main things to plan if you need more balance & order in your life. Meal planners. And here’s a free one I made for you! Finance tracker or a budget planner. Control: self care, mental health, productivity, goals, and anything else you want to take care of! Can be used as an expansion of the main planner or used separately for focused planning. Both ways are awesome and keep you moving forward – that’s the most important benefit of planning habit overall. Always look for a thicker paper for your planner. It prevents paint bleed through and is more durable. An added benefit – it feels more pleasant and almost luxurious to the touch! I like to use 160gsm paper for “Use And Throw Away” kind of planners. You use up daily planners or shopping lists quickly so there’s no need to use thick paper. But if you’re printing something for repeated use (like Finance Tracker), go up to the whooping 250gsm! Your planner will feel like A BOOK. Another reason to use a thicker paper is if you’re printing the planner to gift. Print it on a thicker paper and it will look incredibly attractive and professional. Planning on Sunday. Sunday evening is perfect if you want to concentrate on your next week without distractions. Write a weekly plan & meals to create a backbone for the whole week. You’ll know what & when you will do and how you’ll get the energy to do it. It also gently introduces you back to the work mood. Planning every day in the morning. Early morning, a nice cup of coffee, a morning sunshine and a pretty planner. It sounds fun and it is fun! Planning in the morning creates a backbone for your day. The key here is to choose a healthy amount of tasks. Do as much as you can, but if you feel tired or even exhausted, make sure to include more self care activities. If you use slimmer paper, don’t use wet pens or markers as they may show on the other side or even transfer on your table. Have you ever thrown away half of a notebook because you couldn’t write a pretty headline? Guilty 🙁 If you’re a perfectionist, using a pencil instead of a pen is better – you can always erase your mistakes. If you think pencils are too light, ask for the darkest pencil at the stationery store (and yes, there are pencils that are blacker than the regular black!). I like to use a 9B pencil, which is VERY BLACK. If you live in the US, Staples has a ton of stationery to choose from. P.S. I often pin fabulous stationery & planner pictures on my Pinterest! Have you ever tried to assemble IKEA furniture without instructions? Share in a comment at the bottom of the page! It’s just amazing how these planners control your time, calendar, tasks, health and finances. I got one and these are just the main things to plan if you need more balance and order in your life. It is so helpful and makes a lot of things easy. Finance tracker or a budget planner, meal planner and a planner to note your goals is just all you need to start a planner that fits your needs. I do that and the results are totally amazing. I’ll recommend you do same. Trust me, planning your week on a Sunday is the perfect time. And I also recommend Sunday evening in particular. Thank you for sharing, Ajas! I love planning in the morning! It sure creates a backbone for your day. I always pick tasks I can actually complete so I don’t overwhelm myself. But I think I’ll make sure to include more self-care activities if I can.